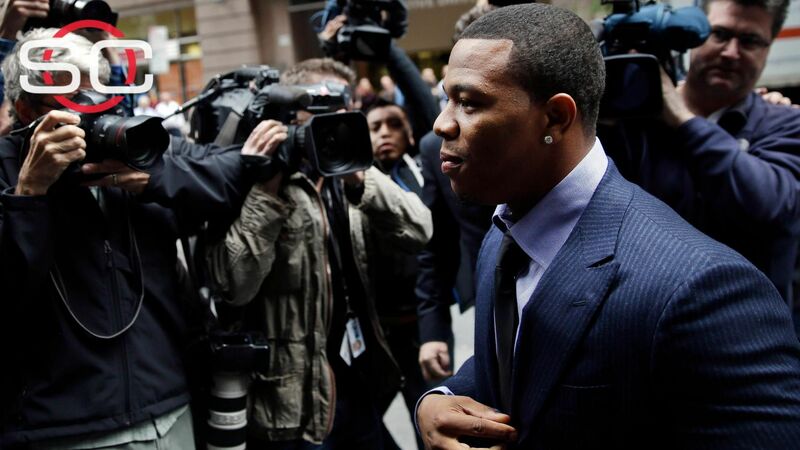 Ray Rice, unlikeGreg Hardy, is still not playing for an NFL team after his high-profile arrest for domestic violence. And if Rice doesn'tget a second chance, the former running back said that instead, he'd like to work for the league to help raise awareness of the issue. Asked by ESPN's "SportsCenter" on Sunday to compare his case to that of Hardy, a defensive end who was given a second chance by theDallas Cowboysafter he was arrested on domestic violence charges while he was a member of theCarolina Panthers, Rice said he could only speak about his own case. Rice, the former Baltimore Ravens star, has been out of the NFL since he was released by the team in September 2014 after a video emerged of him punching his then-fiance Janay Palmer, who is now married to the three-time Pro Bowl player. "I totally understand what my visual did and the effect it had on society and the survivors of domestic violence," Rice told ESPN's SportsCenter on Sunday morning. "So, for me, to never be forgiven ... I understand those things, and I totally take full responsibility for my actions. The one thing I can say is ... I have made a lifelong decision to raising awareness about this. 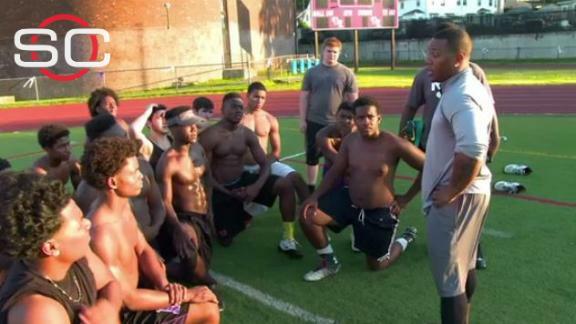 "I used to have a situation where kids were like, 'I wanna be like Ray Rice.' And now I have to think about kids and parents saying, 'I don't want you to be like Ray Rice.' And that haunts me." Rice's comments come after photos from Hardy's case, whichshowed extensive bruising to Hardy's former girlfriend,were leaked to Deadspin. Hardy took to Twitter on Saturday to address the photos and to "express regret"for his actions. The domestic violence charge Rice was facing was dismissed in May after he completed the pretrial intervention program, but the chances of Rice returning have diminished greatly because the NFL season is approaching its halfway point and Rice has yet to receive an official tryout. NFL Players Association president Eric Winston, an offensive tackle with the Cincinnati Bengals, also appeared on ESPN SportsCenter on Sunday and said he doesn't understand why Rice hasn't gotten the same second chance that's been granted toHardy. "It makes you wonder," Winston said of Rice. "I definitely wonder how a guy that's had the career he's had can't even get a tryout. "I definitely think there's been some sort of effort to not have him in the league. That's unfortunate. If there was a guy who could take a message out there, that could take a message to a locker room, it seems that Ray Rice would be a kind of guy that could do that." Rice, who continues to train in case he gets that long-awaited opportunity to play again, said that he has been talking to young players about not making the same mistakes he did and that he'd like "to do something with the NFL" to help spread that message. "I honestly would hope so," Rice said. "I think the NFL has such a huge platform and I've seen the platform I had when I was playing, when I would go out and help people. I go out now, and I don't have an NFL platform, but I'm going out there and helping people out. So if I never played a down again, why not see if I could use their platform to go out there and help make a difference. "Young rookies, anybody in college ... I want to be able to spread all of my experiences to help other people, to make themunderstand that domestic violence is not OK, not even one time." Estranged running back Ray Rice hopes to use his platform with the NFL to speak out against domestic violence - even if he never plays another down in the league again. Former Ravens RB Ray Rice shares his thoughts on what he has learned about domestic violence and why he hasn't been given a second chance to play in the NFL.